Genius hour is an amazing concept that children respond to because they get to learn about any topic they choose. I had a few rounds of Genius Hour last year and the kids thought it was awesome. On Fridays, the question was always, "Are we doing Genius Hour today?" With a grade 1/2 classroom last year, it got difficult to keep up with Genius Hour for a few reasons. 1. 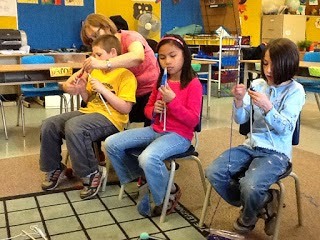 My students were very young, so they still needed a lot of teacher direction and guidance. 2. The range of projects was huge! There were students learning to knit, creating paper mache animals, learning magic, painting on canvas, making wedding cakes and cooking pizza to just name a few. I needed a better plan, I needed to be better prepared and I needed my students to have the skills needed to research an idea or topic, produce not only a product but also be able to share the information they learned from researching the topic. This year, Genius Hour turned into Wonder Workshop. This year I began the year teaching the skills needed for an inquiry based classroom. I modeled my own inquiry and taught and retaught the skills needed for my students to be successful researchers and wonderers. From a modeled lesson on "Reading with a question in mind." 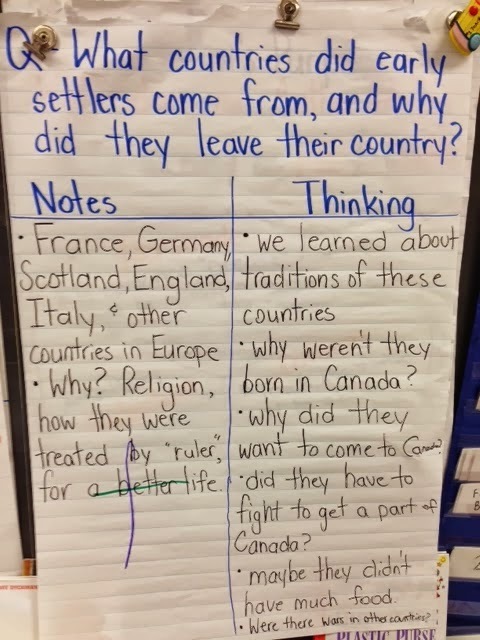 My students completed curriculum based Inquiry projects on Early Settlers where they created the question that they answered. They also did an Inquiry on a creature of their choice. My students learned different ways to show their learning. That it didn't have to be a book created on the iPad. That it could be a poster, an artifact, a presentation or a video. When my students chose to create an artifact they new that there would be questions from their peers on the topic that they would need to know before presenting their artifact to others. When my students had gone through the inquiry process, with how to create a deeper question, how to effectively take notes, how to collaborate with others, this is when I introduced open inquiries. Open inquiries is a form of Genius Hour. EVERYDAY we have Wonder Workshop. Students come into the classroom at 8:30 and from 8:30-9:00 each day they can work on their open inquiries. They can work alone, with a partner or with a group. I have students that are working on commercials to bring more students to the school, I have students that are creating non fiction books on the iPads about a topic they wanted to research. I had a student share their paper book on healthy eating this morning. Because, I took the time to explicitly teach and reteach the tools my students needed, Wonder Workshop goes much more smoothly. Yes, I still have the child that has been creating the same book for the past 3 months and yes I do have children that have changed their question more frequently than they brush their teeth. I have to keep reminding myself that this is a process and that the process is more important than the product. My students still have that excitement like they did last year on every Friday. Now they are excited everyday because they get to start their morning learning about something they have chosen to learn about. They are just as excited to share their learning with their peers and families. 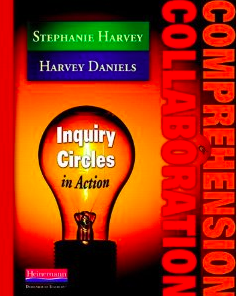 If you too have abandoned Genius Hour, don't give up, a great place to start is to read Inquiry Circles in Action. It has changed the way I teach and has fantastic lessons to get you on your way to a wonderful Wonder Workshop. The first part of your post sounds a lot like Kindergarten: a little chaotic but full of excitement in exploring new things. I really am impressed at how you took the concept and really shaped it to suit your students' needs. I am sure your students benefit greatly from your dedication and reflective teaching. Keep up the great work! I enjoy reading your posts. They get me thinking. Hi Kristen, I actually just started Genius Hour with my kids in May. Because my students had experience with inquiry learning projects around curriculum this year they were prepared for how to work during Genius Hour. I don't know how well it would have worked without that experience. Students already have a vision for how they will track their research and progress. They have experienced a few ways this year (Evernote, Office365, notebook) and were able to choose their own preferred method with Genius Hour. It would all be perfect if it wasn't for the fact that school ends next week and none of them are ready to share yet! I will do Genius Hour again and try finding the perfect time to start it - not too early and not too late. Thanks for the comment Shelly. We have 8 days left of school, could you give a bit more time these last few days for your students to finish? It is such a wonderful experience for the students to share what they have learned. Your thoughts sounded a great deal like mine when we finished our first round of Genius Hour this year. The kids loved it but as I reflected on it as an educator, I saw major research gaps that I needed to improve. Knowing this, we moved straight into an inquiry group process after Genius Hour. This was exactly what my kids needed and I felt much better about their research skills. I plan on doing Genius Hour almost exactly the same as last year but with a much more modeled and practiced research and inquiry unit driving our year prior to our 1st round of Genius Hour. I found that I was trying to foster independence with 24 different projects and teach research at the same time. Too tricky. I am sharing a few of my blog posts that explain some of this if you are interested. Thank you for sharing your thoughts. You blog is very helpful and inspirational. Thank you for your insight Laura! I will definitely look at your blog posts. I loved the honesty in this post and plan to link to it in my tech class assignment! I've been mulling over Makerspace and Genius Hour, and Wonder Workshop sounds like the best approach. Thanks so much for sharing! Can you tell me which app Grant used for his cool shark book? I loved the combination of drawings and photos, text and voice. All just right for first grade! Thanks for your response Jeanne! Grant used the book creator app then took screenshots of his book pages, then imported the pics into the Explain Everything app and recoded his voice in explain everything. Thanks for your honesty in this post! As a kindergarten teacher, I ran a Genius Hour in collaboration with a second grade teacher this year, and most days were just like you had described. After a few days of Genius Hour I was starting to wonder about its effectiveness. While I know the students learned a lot (they certainly surprised me with their knowledge during their presentations), I think the whole process would have run smoother if we had first prepared the students for the independence Genius Hour requires. Thank you for writing this post and for inspiring teachers to find the confidence to succeed! I will be sharing this with primary teachers! Really enjoyed your post. I work with teachers Pre-K thru 12 on transforming their practice to a student driven inquiry model that uses the affordances of technology to help facilitate and document learning. (I'm an EdTech Facilitator.) I am fascinated by your blog post as I understand the technology piece but am still learning a great deal about inquiry and what it might look like at each level. After reading the first part of your post, I was surprised to read that you still have so many different types of projects going on. Please feel free to continue to "grow us" as your readers on your practice! I really enjoy and am interested! Wondering if I should buy the book! I will also read the blog posts of Laura to see if she has additional info! I am so glad that you posted this for everyone. My partner teacher and I attempted Genius hour as an end of the year project with a small group of our students. We have had a lot of the same frustrations as you do, with the biggest being that the students have no idea how to research. Next year, we will take your suggestion and teach those skills before we ever bring up the Genius hour projects. Great post! Teaching students how to do inquiry research is an important base. Thanks for the book recommendation too! Hi Kristen, can you comment about your wonder books for wonder workshop? Do you have 2 books? A wonder book and/or a thinking book? No one’s book will look the same. You can get messy with it, but you should treat it with pride and care. Let the journey begin. This is EXACTLY how I have been feeling during our inquiry time. We are in the middle of an inquiry session now and all I want to do is abandon it but I think I would break some of their hearts. Sigh. I've ordered the book so hopefully I can do some reading, thinking, and work on my understanding. I will keep in mind that the process is the most important. I appreciate reading about your journey. Looking forward to poking around your blog a little more. The thing that worries me about Genius Hour is that it seems to be more of an event, rather than connected to learning. I hear many teachers 'doing' Genius Hour who are also complaining about not having enough time to 'cover' all the expectations. I love the idea of a Wonder Workshop where the learning can be focused on specific topics in science or social studies content, or students can explore their own passions with a focus on specific language expectations. As a teacher, we need to have a clear direction in where we are heading and what the learning is that is happening in our classroom. Thanks for this great post!